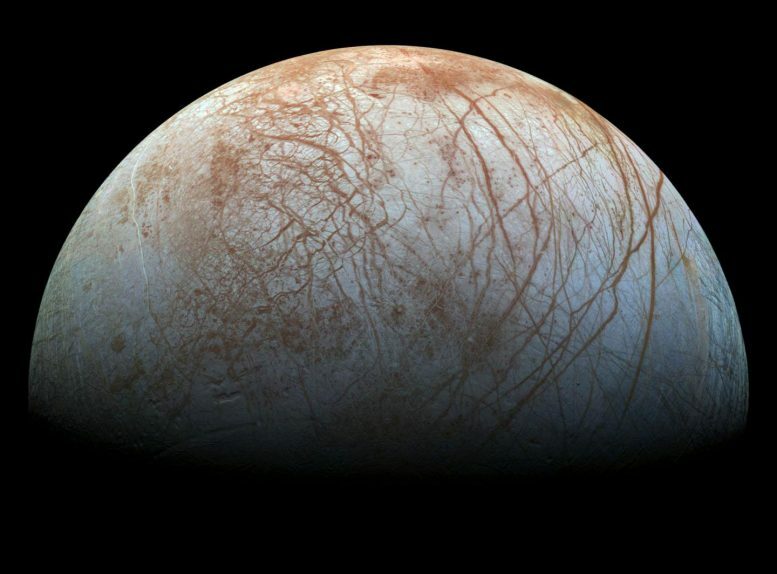 New research shows that Jupiter’s moon Europa could have subduction zones, which could supply chemical food for life to a subsurface ocean. A Brown University study provides new evidence that the icy shell of Jupiter’s moon Europa may have plate tectonics similar to those on Earth. The presence of plate tectonic activity could have important implications for the possibility of life in the ocean thought to exist beneath the moon’s surface. The study, published in Journal of Geophysical Research: Planets, uses computer modeling to show that subduction — when a tectonic plate slides underneath another and sinks deep into a planet’s interior — is physically possible in Europa’s ice shell. The findings bolster earlier studies of Europa’s surface geology that found regions where the moon’s ice shell looks to be expanding in a way that’s similar to the mid-ocean spreading ridges on Earth. The possibility of subduction adds another piece to the tectonic puzzle. Part of the excitement, Johnson says, is that surface crust is enriched with oxidants and other chemical food for life. Subduction provides a means for that food to come into contact with the subsurface ocean scientists think probably exists under Europa’s ice. “If indeed there’s life in that ocean, subduction offers a way to supply the nutrients it would need,” Johnson said. On Earth, subduction is driven largely by differences in temperature between a descending slab and the surrounding mantle. Crustal material is much cooler than mantle material, and therefore denser. That increased density provides the negative buoyancy needed to sink a slab deep into the mantle. Though previous geological studies had hinted that something like subduction could be happening on Europa, it wasn’t clear exactly how that process would work on an icy world. There’s evidence, Johnson says, that Europa’s ice shell has a two layers: a thin outer lid of very cold ice that sits atop a layer of slightly warmer, convecting ice. If a plate from the outer ice lid was pushed down into the warmer ice below, its temperature would quickly warm to that of the surrounding ice. At the point, the slab would have the same density of the surrounding ice and would therefore stop descending. But the model developed by Johnson and his colleagues showed a way that subduction could happen on Europa, regardless of temperature differences. The model showed that if there were varying amounts of salt in the surface ice shell, it could provide the necessary density differences for a slab to subduct. And there’s good reason to suspect that variations in salt content do exist on Europa. There’s geological evidence for occasional water upwelling from Europa’s subsurface ocean — a process similar to the upwelling of magma from Earth’s mantle. That upwelling would leave high salt content in the crust under which it rises. There’s also a possibility of cryovolcanism, where salty ocean contents actually spray out onto the surface. In addition to bolstering the case for a habitable ocean on Europa, Johnson says, the research also suggests a new place in the solar system to study a process that’s played a crucial role in the evolution of our own planet. Johnson’s co-authors on the paper — Rachel Sheppard, Alyssa Pascuzzo, Elizabeth Fisher and Sean Wiggins — are all graduate students at Brown. They took a class Johnson offered called Ocean Worlds, which focused on bodies like Europa that are thought to have oceans beneath icy shells. Be the first to comment on "Jupiter’s Moon Europa Could Have Subduction Zones"